Overall Height : 13' 5-1/4"
Total Sq. Ft. : 336 Sq. Ft. Double Doors : 60" x 80"
Reverse gabled roof is made of two surfaces that slope upward to meet along a single ridge, forming a peak at either end of the house and allowing debris, rain and snow to slide off the roof on either side. This version of our popular dual shed design features simpler construction and an easy to construct roof line system. 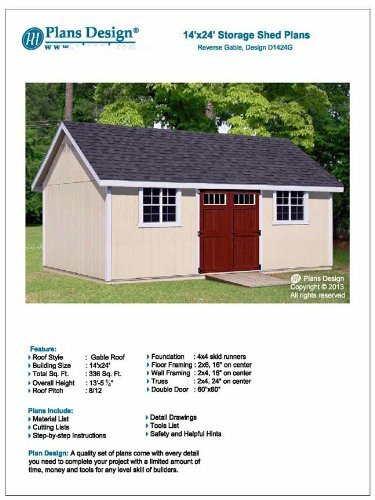 Build this versatile dual purpose shed as a functional addition to any yard, garden or estate. Enjoy the roomy shed offers large square feet of storage space and a roof design that offers extra loft storage space. If you have any questions about this product by Plans Design, contact us by completing and submitting the form below. If you are looking for a specif part number, please include it with your message.